Talented local students showcase their science fair projects at the District 16 Science Fair held at Belmont College. St. Clairsville, OH (March 21, 2019) – For more than 25 years, students from local schools have displayed hundreds of science projects at Belmont College. The halls were recently filled once again with scientific inquiry. 94 students from eight local schools competed in the 2019 District Science Fair at Belmont College’s Main Campus in St. Clairsville on Saturday, March 16. Students from the following schools participated: Barnesville Middle; Bishop John King Mussio Elementary; Bishop John King Mussio Jr. High; East Richland Christian; Harding Middle; St. Clairsville Middle; St. Mary Central Martins Ferry; and St. John Central High School. Chosen as the top project was that of Emma Connors (pictured left), a 10th grade student from East Richland Christian. Her project titled “How Seed Inoculation Affects Soybean Germination at Various Water pH Levels” received the Belmont College President’s Award. She is pictured here with Dr. Paul F. Gasparro, Belmont College President. The District Science Fair is for students who have participated in and achieved superior scores in their school fairs or have been selected by their teachers as having exceptional projects. These projects are judged again by more rigorous standards, and the top projects among all displayed are recognized and rewarded with superior ratings and special awards sponsored by a variety of donors. The very top students are then selected to represent District 16 at the state-level competition at The Ohio State University in Columbus, Ohio. The following students received superiors this year, and as such are eligible to represent District 16 at State Science Day, the state-level of competition which will be held at The Ohio State University on May 11, 2019: Sarah Allen, Harding; Anna Arai, Bishop Mussio Jr. High; Arabella Bloomer, Bishop Mussio Jr. High; Kayla Biasi, Harding; Daniel Bolster, Bishop Mussio Jr. High; Duncan Bonjour, Bishop Mussio Jr. High; Gia Bowman, Harding; Emma Conners, East Richland Christian; Gracie Crumm, East Richland Christian; James Devereaux, Harding; Jenna Duvall, Barnesville; Bailey Gallagher, East Richland Christian; Elissa Goudy, St. Clairsville; Joe Green, St. Mary’s; Alina Handte, East Richland Christian; Ray Konkoleski, St. Mary’s; Natalie Lucas, Bishop Mussio Jr. High; Alexis Lukacena, Harding; Ella Maragos, Bishop Mussio Jr. High; Vanessa Murphy, St. Mary’s; William O’Brien, Harding; Jackie O’Karma, Bishop Mussio Jr. High; Jordan Ribar, Harding; Alexis Richards, East Richland Christian; Drew Roberts, East Richland Christian; Isaac Rosel, Harding; Nash Roberts, East Richland Christian; Andrew Rohde, Bishop Mussio Elementary; Matthias Sacco, St. Mary’s; Julie Schlanz, St. John’s Central; Sarah Senakievich, St. Clairsville; Paul Stecker III, St. Mary’s; Danica Stoffer, East Richland Christian; Tim Stoffer, East Richland Christian; Liam Tomlin, St. Mary’s; Alaina Vrable, Bishop Mussio Elementary; Kaylynn Yockey, East Richland Christian; and Ava Zelek, St. Mary’s. Chosen as the top project was that of Emma Connors, a 10th grade student from East Richland Christian. 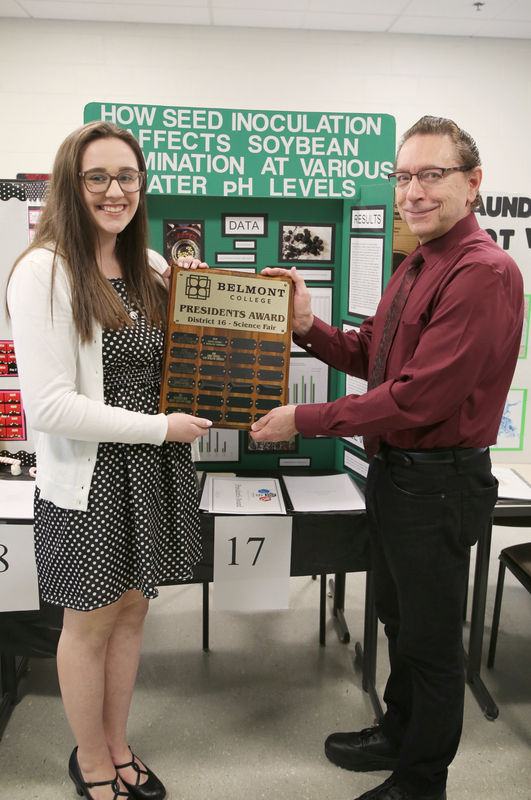 Her project titled “How Seed Inoculation Affects Soybean Germination at Various Water pH Levels” received the Belmont College President’s Award. Chosen for the Runner-up Award was Tim Stoffer, a 9th grade student from East Richland Christian, for his project titled “The Effect of Extremely Low Frequency Electromagnetic Radiation on Soybean Plant Growth” This is the Excellence in Science Award, sponsored by the District 16 Science Fair Committee. The following students received the Phillip Skinner Memorial Award, sponsored by Mrs. Linda Dunlap: Luke Deptula, Bishop Mussio Jr. High and Daniel Bolster, Bishop Mussio Jr. High. Award in Microbiology: Jenna Duvall, Barnesville, as well as Owen O’Brien and Jordan Ribar who worked as a team from Harding. Additionally, Drew Roberts received the American Electric Power Award, while the following students received the Ohio Tuition Trust Authority Scholarship: Kayla Biasi; Alexis Lukacena; James Devereaux (Alternate) and Isaac Rosel (Alternate). Additionally, Emma Connors from East Richland Christian received the Continuing Project Award. The following students received recognition and a camp scholarship from BWiser Institute: Sarah Allen, Anna Arai, Arabella Bloomer, Gia Bowman, Gracie Crumm, Jenna Duvall, Natalie Lucas, Ella Maragos, Jackie O’Karma, and Alexandra Schmitz. Michael Green; Ray Konkoleski; Alex Richards; Nash Roberts; Andrew Rohde; Kimber St. Clair; Danica Stoffer; Liam Tomlin; and Alaina Vrable. Those who served on the 2019 Science Fair Committee were: Christopher Clantz, Associate Professor of Natural Sciences and Committee Chair; Nick Wittenbrook, Academic Specialist and Adjunct Faculty; Rita Fulton, Professor of Biology; Theresa Danaher, Principal, Bishop John King Mussio Elementary; Sandy Morelli, Assistant Principal, Bishop John King Mussio Junior High School; and April Woods, East Richland Christian Schools.